Will Downing’s voice is one of the most distinctive, loved and instantly recognizable voices in R&B. His flawless, emotive, buttery-smooth and agile honey-toned baritone, along with his impeccable phrasing and jazz-fueled agile runs, seamlessly bridge the worlds of R&B and Jazz. “I pinch myself everyday because I can't believe that after all this time I'm still making music for a living,” shares the charismatic singer/songwriter. “19 albums and 28 years of recording later and I'm still blessed. Truly Blessed! 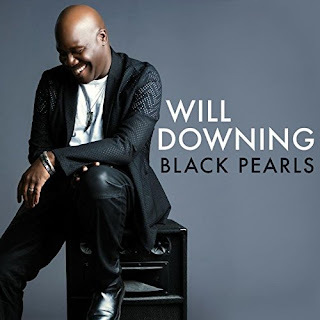 !” Shanachie Entertainment will release Black Pearls (July 8, 2016), Downing’s highly anticipated CD and his first full-length album in six years. Black Pearls exemplifies the caliber of songs that Downing has long been associated with. An accomplished composer in his own right, Downing takes on the ultimate challenge on Black Pearls as he reinvigorates chart-topping gems originally performed by some of the greatest female voices to grace R&B. He rekindles the soul and ignites a fire in songs made famous by Chaka Khan, Deniece Williams, Randy Crawford, Cherrelle, Jean Carne and Phyllis Hyman, among others. Black Pearls opens with the album’s first single and 1988 Cherrelle hit “Everything I Miss At Home.” Downing originally met Cherrelle in the 90s during a USO tour. The charismatic and charming vocalist jokes, “My sister calls ‘Everything I Miss At Home’ the ‘you better do right song.’” Will’s sublime performance hits all the right notes, signaling for an enchanting journey ahead. “‘Don’t Ask My Neighbors’ has always been a favorite of mine,” shares Downing. “The subject of communication will never grow old." Downing admits to being a long-time fan of The Emotions, not only as a solo act but also as backing vocalists for the likes of Earth, Wind & Fire. Angela Winbush has been a good friend of Downing’s for years and he returns the favor with an impeccable and unforgettable version her #1 hit on the Billboard R&B charts, “Your Smile.” “Everyone that hears the beginning of this song does one of two things. They either throw their hands in the air and say ‘That’s my jam’ or they look at me and say "no you didn't!’” Do it he does! Will Downing will leave you breathless with his stunning version. When you hear the opening four notes of “Get Here,” you instantly know what song it is thanks to Brenda Russell, who wrote and recorded the song and Oleta Adams, who later scored a major international hit in the early 90s. Black Pearls unites Downing with many close associates including his wife, the beautiful and talented singer Audrey Wheeler, who has worked with everyone from Chaka Khan and the Pointer Sisters to Freddie Jackson and Narada Michael Walden, and that is just the short list. Celebrated saxophonists Najee and Kirk Whalum also make appearances on Black Pearls. “Street Life” will put you in the groove as Downing serves up a swingin’ version of the Randy Crawford/The Crusaders hit featuring the tenor of saxophonist Najee and the funky keyboards of Mike Logan. Black Pearls keeps the hits flowing with Chaka Khan and Rufus’ timeless 1977 hit “Everlasting Love.” Together with Chris “Big Dog’ Davis, Downing wrote a riveting arrangement of one of Deniece Williams’ signature tunes, “Black Butterfly,” a powerful anthem written by Barry Mann/Cynthia Weil. Dexter Wansel’s “Nights Over Egypt,” is given a jazzy and exotic treatment and features stellar flute work from saxophonist Kirk Whalum. Phyllis Hyman’s “Meet Me On the Moon” is a standout, as Downing’s crystal clear and velvety smooth vocals, impeccable diction and tender phrasing conjure up the greatest of love stories. Black Pearls closes with the magnificent “Don’t Let It Go To Your Head” which features an orchestra and full horn section.